February is Black History Month and every year we get many books on the subject such as the African American Almanac: 400 Years of Triumph, Courage and Excellence by Lean’tin Bracks or Discovering Black America: from the Age of Exploration to the Twenty-First Century by Linda Tarrant-Reid. As I like to understand history through the people who lived it, here are some biographies that will give you a taste of what was going on in the time period they lived. The Black Count: Glory, Revolution, Betrayal and the Real Count of Monte Cristo by Tom Reiss describes the life of Thomas-Alexandre Dumas, 1762 -1806, who lived in France, and whose swashbuckling exploits were portrayed in the book and movie The Three Musketeers. Medgar Evers: Mississippi Martyr 1925-1963 by Michael Vinson Williams tells the story of the civil rights movement in the deep south. 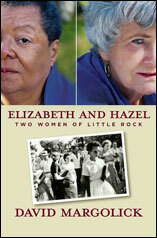 Elizabeth and Hazel: Two Women of Little Rock by David Margolick tells the story of two young women, those pictured in the famous image from September 1957 that captured the racial tension and hatred that occurred after desegregation, and follows them through their lives. Desert Rose: the Life and Legacy of Coretta Scott King by Edythe Scott Bagley is the biography of the wife of Martin Luther King, Jr.
Quiet Strength: the Faith, the Hope and the Heart of a Woman is an autobiography by Rosa Parks, who started the bus boycott in 1955 and was a hero of the civil rights movement. And for a few pages on each of several heroes, try the book, Heroes for my Son by Brad Meltzer. When Brad Meltzer welcomed his first child into the world, he started keeping a list of heroes whose virtues and talents he wanted his son to emulate; the short vignettes include Barack Obama, Muhammad Ali, Frederick Douglass, Rosa Parks, Nelson Mandela, Martin Luther King, Jr., Jesse Owens, Jackie Robinson, and Harriet Tubman. If they whet your appetite, you can find longer biographies of each of these people in our catalog. This entry was posted in Recommendations, Uncategorized and tagged Black History Month, recommendations by ccld. Bookmark the permalink.